The results of the 11 top-scoring candidates out of the 39 running in the first round of the 2019 Ukrainian presidential elections. The voting share of the other candidates ranges 0,01 to 0,57%. Three major exit polls predicted a 29.2-30.4% result for comedian Volodymyr Zelenskyi, 17.8%-19.2 for incumbent President Petro Poroshenko, and 13.8%-14.2% for Tymoshenko. The results of the first round of the Ukrainian 2019 presidential elections show that the surveys were pretty accurate. Zelenskyi wins the first round with more than 30.2%. Poroshenko receives 15.9%. Former Prime Minister Yulia Tymoshenko is trailing in third place with 13.4%. Nobody received more than 50%, this means that Ukraine will vote again in the run-off, where Zelenskyi and Poroshenko will compete. According to the law, the repeated voting will take place three weeks after the day of the first round, on 28 April. Volodymyr Zelenskyi is a TV celebrity who has been promoted for years by the second most popular Ukrainian channel “1+1” owned by oligarch Kolomoyskyi. Zelenskyi had multiple comedy shows on 1+1, as well as co-hosted programs with various Russian comedians. In November 2015, the TV series “Servant of the People” premiered on 1+1, where Zelenskyi plays a part of a history teacher, Russian-speaking Ukrainian Vasyl Holoborodko who by chance of fate becomes president. Its second season came out in 2017, and the third started in late March 2019, just several days before the real presidential elections, in which Zelenskyi had participated. This TV series can be called the longest political commercial ever, since many people all-around Ukraine voted for a positive TV character having no idea what the real Zelenskyi is going to do as president – he hasn’t still voiced who the members of his team will be and what policies he is going to pursue. 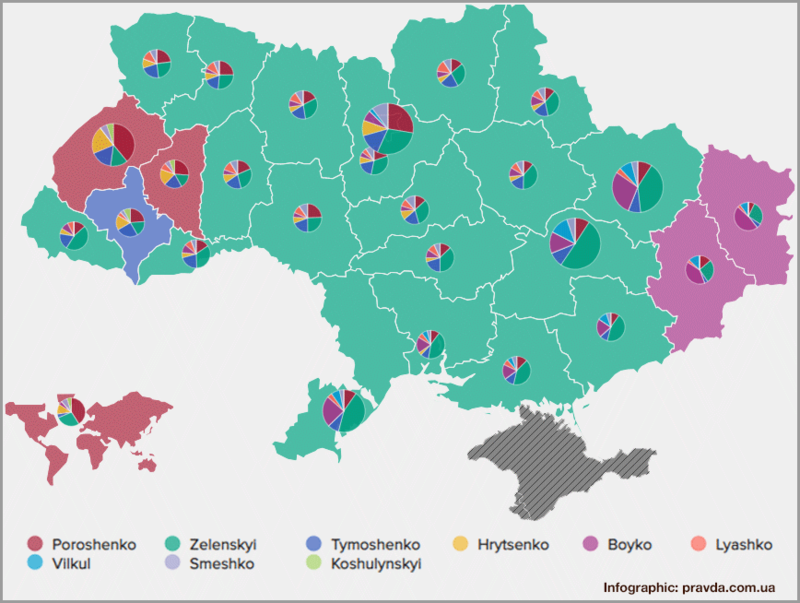 Who leads in Ukrainian regions. Some social media users recall the first Ukrainian presidential elections when the local communist leader Leonid Kravchuk won in all regions except for the western-Ukrainian Lviv, Ivano-Frankivsk, and Ternopil where pro-Western candidate Viacheslav Chornovil had higher results. On the other hand, Ukrainian media have been demonizing incumbent President Petro Poroshenko starting from 2014. It has been normal for Ukrainian media to skip reporting on any successes the state has achieved or to downplay their importance, focusing on any negative events, as well as to blame Poroshenko personally of any failures, no matter real or fake. And it unfolded amid the disastrous information policy of the presidential administration and multiple dubious appointments. In fact, over the five years in which Ukraine succeeded in not just surviving as a state, but also in conducting many ground-breaking reforms. Meanwhile, the media coverage of the presidential activities typically consisted of the messages that Poroshenko doesn’t do something or does something wrong or covers corruption or himself embezzles or even is worse than oustd ex-president Yanukovych. In the background of this information tendencies of the Ukrainian media, Russia didn’t stop pushing false narratives of Ukraine as a failed state with incompetent leadership. For example, the latest case in the row was linking Poroshenko’s name to suspected embezzlement in Ukrainian defense industry concern Ukroboronprom by journalists of bihus.info without any real connection of Poroshenko to the suspected corruption schemes. Ex-PM Tymoshenko, one of Poroshenko’s major rivals at the election, tried to start the impeachment procedure, and the far right party “National Corps” whose candidate doesn’t participate in the election activated and started spinning the topic, attempting to stick the label of “marauder” on Poroshenko. Plus, Poroshenko made the revival of the Ukrainian army of the cornerstones of his campaign (the campaign’s slogan is “Army, Faith, Language”). Meanwhile, not just the very real Russian threat but also the ongoing war itself have almost disappeared from the Ukrainian news, making many Ukrainians believe that Ukraine is already at peace. Of course, such a media background made Zelenskyi appear much better than the incumbent President for an average voter. As well, the fictional TV character stole the spotlight from the real-life Zelenskyi, a crony of fugitive oligarch Ihor Kolomoyskyi, who himself has business connections to Russia, uses offshore schemes and ridiculed Ukraine as a country and Ukrainians as a nation many times in his sketches. Almost the same had happened back in 2010 to another pro-Western President Viktor Yushchenko, whose popularity was totally destroyed in a few years by domestic media which led to the subsequent presidency of Viktor Yanukovych. 2. Tymoshenko has lost, can she return? Former Prime Minister Yuliya Tymoshenko came third in the 2019 Ukrainian presidential election with about 13% of the vote share. In December 2018, just before Zelenskyi announced his bid for the presidency, she led in surveys with 12-14%. Five years ago, Tymoshenko finished the 2014 presidential run with almost the same 12.8%. This shows that her electorate is stable. Can Tymoshenko become the head of state? Well, technically, she still has three possibilities. This means that if Zelenskyi withdraws before 16 April, Tymoshenko will take his place in the run-off and can try to beat Poroshenko in the second round. Though if Zelenskyi will withdraw later, only Poroshenko will remain in the ballot, according to Paragraph 4 of the same Article. The cited norm of the law and the mentioned statements of the politicians may shed light on possible agreements between Tymoshenko and Kolomoyskyi who is behind Zelenskyi and with whom Tymoshenko had reportedly met several times before the elections. They could have planned to have Zelenskyi and Tymoshenko in the run-off round and withdraw Zelenskyi days before the voting when only one candidate (read: Tymoshenko) would remain in the ballot paper. At least, Poroshenko seems to believe that it was the scenario, alternatively, he could imply that Russia wanted to see Tymoshenko and it overt supporter Yurii Boyko. There is another possibility for Tymoshenko to head Ukraine. Ukraine is a parliamentary-presidential republic, where the parliament, Verkhovna Rada, has more powers than the head of state, the president. Back in September 2018, Yuliya Tymoshenko presented her conception of a “new constitution of Ukraine.” Her project makes Ukraine a purely parliamentary republic, in which most presidential powers would be transferred to a chancellor appointed by the parliament. The President in this scheme plays a mere ceremonial, non-executive role. If Tymoshenko’s plan was agreed between Tymoshenko and Kolomoyskyi, then we may witness an attempt of the “Servant of the People” party, existing only on paper for now but already having high ratings, to win the constitutional majority at the parliamentary elections in October 2019 with subsequent efforts to amend the Constitution in order to change Ukraine’s form of the government. The third possibility for Tymoshenko to become the head of state is much more traditional – she can still wait five more years and run for the presidency once again in 2024. However, her popularity wanes year by year (she had 25% in the first round of the 2010 presidential elections against 12-13% in 2014 and 2019). Thus, this option is much more unlikely than replacing Zelenskyi in the run-off or attempting to break the existing government form and become a chancellor. The 2019 elections confirmed that far-right parties still have almost zero popularity in Ukraine. The only far-right candidate Ruslan Koshulynskyi (“Svoboda” party, also supported by the C14 nationalist group) gets only 1.6%. The actual results of the free and unfettered expression of the Ukrainian citizens sharply contrast with the half-decade-long Russian propaganda campaign exploiting the narratives of the purported rise and growth of fascism and nationalism in Ukraine. The free parts of Luhansk and Donetsk oblasts showed just the same result as they showed at several previous elections. Both regions still vote for Yanukovych, or rather for his fellow party man. 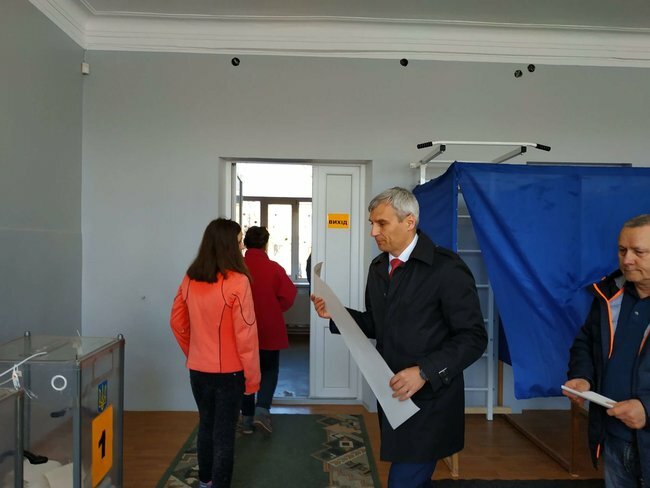 Yuriy Boiko leads in both regions with more than 40%. Openly pro-Russian Boiko is the leader of the parliamentary party “Opposition Bloc,” the largest fragment of Yanukovych’s Party of Regions which collapsed back in 2014 shortly after its leader was ousted by the Euromaidan revolution. Both eastern-Ukrainian oblasts were the electoral “foothold” of Yanukovych and his party, and the latest voting shows that they remain as such. The war didn’t change anything in their political preferences. Volodymyr Zelenskyi has a strong chance to become President at the run-off. However, we can’t say that Petro Poroshenko has no chances. Especially, if the incumbent President manages to consolidate the pro-Ukrainian electorate in the next three weeks.